You’re scrolling your Instagram feed on a Friday and see “#tbt to the best vacation ever.” You think: Nice try Susan, but it’s Friday, you idiot. *Checks the timestamp* “posted 23 hours ago”. Damnit. Fake followers? Still can’t link from posts? Instagram had a perfect solution. No more chronological posts. I use Instagram for purely personal purposes. It doesn’t affect my life or business or income. And even I was pissed. So I get why bloggers who count on their audience and engagement of their followers to build their brand, sell things, make money are pissed too. At first, I was like you know what get over it and stop complaining about a social network on that social network, but on second thought, I do get it. But fear not, even if your Instagram activity has decreased, there are a few ways to work around this pesky new algorithm. Use Instagram stories to draw attention to new posts. 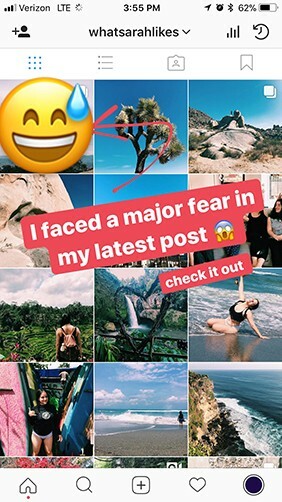 Experiment with contests and giveaways, again capitalizing on the chronology of IG stories. Post a story about a giveaway on your account and create engagement by asking your followers to like or comment on your most recent post. It will not only increase engagement on your page but ensure that your followers take a look at your feed. It doesn’t have to be a pricey gift. Start off small with something like a t-shirt, sticker or something easily accessible to you. Now that Instagram has instituted their “Polls” function, a good way to test whether people see your posts in their timelines is to take a quick survey. A simple “Did you see this post on your timeline?” “Yes or No” could be very insightful as to whether it’s the algorithm that’s affecting your engagement, or if the post itself just wasn’t all that engaging. You’ll get valuable feedback, plus everyone who clicks no will be intrigued to go check it out. Consider an ad or a sponsored post. If you rely on Instagram as a primary resource for marketing your business and have experienced a noticeable decrease in engagement, it could be time to consider paying to run an ad. Ads can cost anywhere from $0.70 and $1.00 per click. Maximize your use of other social networks. 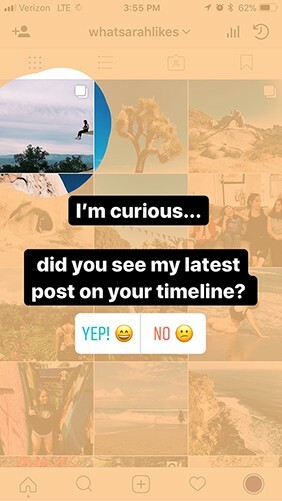 Instagram has given no indication of going back to their old chronology, so it may be time to rethink your social media strategy. Use twitter and Facebook to promote your posts. Don’t limit your images to Instagram and start increasing engagement on other platforms to capitalize on exposure across all channels, if Instagram traffic is suffering.